You can post a charge adjustment, which increases an account balance, to a patient's ledger. 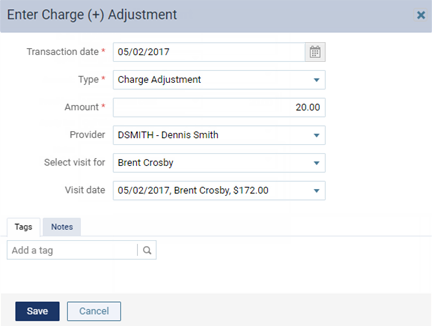 On a patient's Ledger page, click (or tap) Charge Adjustment. The Enter Charge (+) Adjustment dialog box appears. Enter the adjustment details, such as the type, provider, and amount. Select Visit for - The adjustment is to be associated with a visit from the current patient or another member of his or her household. If you select [Guarantor], you can apply the adjustment to a visit from any member of the household. The selection cannot be changed after you save the adjustment. Visit date - The date of service (for the patient or guarantor selected from the Select Visit for list) to associate the adjustment with. Select [None] if the adjustment is not to be associated with a visit date. This option is available only if the current patient's name or [Guarantor] is selected from the Select Visit for list. The selection cannot be changed after you save the adjustment. Note - Type any relevant notes regarding the adjustment.